I am totally excited about sharing my latest experiences with all the different ways I have been making money online. I think I will start with my Squidoo Money experiment. Two years ago, I wrote about the 60 Day Squidoo Challenge I was participating in, but I didn't complete it. Why? Well, because my efforts weren't producing a lot of results. That's because I hadn't cracked the Squidoo code yet. Let me explain. 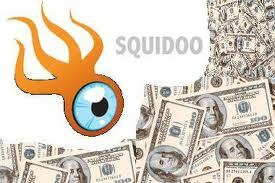 When I first started using Squidoo, I knew little about creating truly profitable lenses. I was basically just churning out lenses on topics I thought would be profitable such as the latest teen heart throbs, making money online and a few topics I knew something about. Did I make money using Squidoo? Yes, but most of the money I earned came from products or sites I recommended. I got a lot of referrals, commissions from sites or products I recommended and a few clickbank sales. You're probably thinking I shouldn't be complaining. I am not, but I can't believe how I was missing out on sales because I was doing it all wrong. What has changed about my Squidoo lens building? There is a winning Squidoo formula that can be followed to create profitable lenses over and over again! What difference does this Squidoo formula? Now I make sales almost every day from Amazon or ebay! After years of failing at earning commissions with Amazon, I received my first direct deposit two months after following this Squidoo guide. Since this amazing discovery, I have created a total of 55 lenses. The really surprising part of it all is the speed at which you can profit from a Squidoo lens. I created a lens and in a few days made a sale! What I couldn't believe is that none of the backlinks I had created for the lens were visible yet. That beats the speed of making a profit with an automated blog! What's even more unbelievable is that you don't need tons of visitors to make a profit. The image on the left proves that even a low ranked Squidoo lens with little traffic can make sales! If you would like to get the free guide I read that helped me make profitable Squidoo lenses, sign up for Squidoo using my referral link. Contact me with the username you used and I will send it to you. I will even send a few backlinks your way to get you on the right path! Can't wait for the next Squidoo payday next week! My payouts have increased every month since I followed this free ebook. When you read this free Squidoo lens ebook and you take action, your lenses will make money too! Am already in squidoo what should i do to get the info? thanks for this useful post.i try and come back to read more of it. I've focused a lot of my online time in the last 6 months to learning everything I could about Squidoo and SEO, and making more Squidoo pages. Now my work is starting to pay off. I used to only make about $30 per month, and now I'm looking forward to a $900+ paycheck when Squidoo pays out next week. I'm using my extra money to pay down debt too, and also supplement our retirement savings.